Laguna Etching Press 23112 “C” ALCALDAE No. 3660. Electric Motorized Control. Bed size is 37.5” x 60.” Fully functional. Comes with a set of almost new felts. Metal Bed in polished condition and comes with a new plexiglass layer over a 1cm grid. Weight estimate 900 pounds. Press is easily dismantled into 4 components. Motor and drive relay switches all work. Press either forward or reverse buttons to move in either direction. Safety feature requires one finger on either hand to press the button. Top roller is adjusted by two micrometers. * Two of the small guide rollers for the bed are missing but we never replaced them as it did not affect the press function. Buyer must PICK UP or do all shipping arrangments on own. This press is located near Brownsville OR. You will need four strong men even when it is dismantled into four sections. 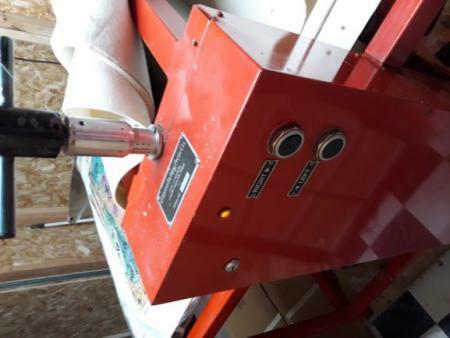 This is an excellent press used for intaglio printing and only selling due to health issues.